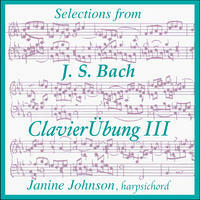 Janine Johnson : Selections from JS Bach ClavierUbung III. One of my favorite works for organ is the great Praeludium in E flat from Bach's Clavier Übung III, which is usually followed in recital by the Fugue in E flat, called "St. Anne's", though in Johann Sebastian Bach's manuscript the two are separated by the entire remainder of the work, 27 pieces in all. As a harpsichordist, the temptation was too great to not adapt these and other works to my own instrument. The Praeludium especially reminds me of the French Ouverture in ClavierÜbung II and the Ouverture of Partita #4 in ClavierÜbung I, both harpsichord works. I also have a great fondness for Bach's Chorale Preludes, as well as his Fugues. ClavierÜbung III being organ music, often has pedal parts, though much is also for manuals alone, including the Duetti which are often performed on the harpsichord. I chose for this album pieces that both touch me musically and are playable on the harpsichord. Those with pedal parts sometimes required octave transpositions but mostly demanded I get my not so large hands to stretch more than usual. These large reaches were in part facilitated by the keyboard of the Gräbner harpsichord with it's narrow key span. The piece in this set that required the most rewriting was "Vater unser im Himelreich" (two manuals + pedal), but being one of the most complex and moving of the entire book, I could not leave it out. For this album I worked from the facsimile of the original publication (1739) and found some of the text to be different from "corrected" modern versions. Of particular note is the hair raising cross relations in the "Fuga super Jesus Christus unser Heiland ". Bach is very specific in his notation and in order to retain an extensive canonic imitation between the bass and alto there can be no other option than what he has written (this section appears in the backdrop on the album cover). The other unfortunate "correction" is in Duetto IV. To my ear Bach's sometimes strange harmony is part of what makes his music so fascinating. I also love some of his allusions to the texts of the Chorales he has chosen to set, such as the great flowing river in "Christ unser Herr zum Jordan kam". The harpsichord, built in 2008 by John Phillips, Berkeley, is modeled after the 1722 Johann Heinrich Gräbner preserved in the Villa Bertramka in Prague; the earliest of four surviving Gräbner harpsichords. Although now much modified, it is a very good example of the large middle German harpsichord with which Bach would have been intimately familiar. It is even likely that Bach knew J. H. Gräbner, as the latter held the position of official tuner at the Electoral Saxon court in Dresden. One of Gräbner's sons, Christian Heinrich, studied organ with Bach in Leipzig. Typical of the largest German instruments of the 1720s; it has a range of FF-d3, two manuals with a sliding coupler, and a registration of two unisons and an octave. Special thanks to the owner for the use of this harpsichord and to John Phillips for his assistance, and allowing me the use of his shop for recording. License Harpsichord and fortepiano classics by Janine Johnson for your project. Play the music of Janine Johnson in your restaurant or store. Worlds Bliss - Medieval Songs of Love and Death by John Fleagle: austere and beautiful medieval songs.